Why Is My Tulip Poplar Losing Leaves in the Summer? Tulip trees are very popular hardwood trees grown for their beautiful leaves, tulip-like blossoms and fast growth. They can grow for decades and will tower at more than 150 feet in height. Other names are yellow or white poplar. Bees use the fragrant blossoms to produce a beautiful honey. Allow the tree to grow with a central header by not pruning the growing tip at all. It will grow quickly and if left alone will grow strong. Because the older wood is resistant to storm damage, it should not be bothered and allowed to grow. Prune out any young wood that is storm-damaged. Make an angled cut so the rainwater will run off the cut and not puddle. If the branch is damaged all the way back to the trunk, leave an inch or 2 of it sticking out from the tree to make sure the trunk bark is not damaged. Remove lower branches when the tree is a few years old only of necessary, like when it is planted along a sidewalk. Typically, tree pruning is done while the tree is in a dormant stage during late winter or early spring. The tulip tree is amazingly resistant to storm damage and insect damage, rarely needing any pruning. Cut off any damaged branches. To check if a tree branch is healthy and living, scrape the wood with a knife. Greenish white underneath the bark indicates a living branch. Brown or black means the branch is dead. Make a 45-degree downward angled cut to a healthy outward-growing branch. Cut off any branches that are growing outside of the designated planting area. To cut off a branch, make a cut right next to the branch collar. The branch collar is the swelling that attaches the branch to the trunk. Remove any competing leaders. Tulip trees generally will grow with one strong central leader (vertical growing shoot); however, if there are other competing leaders cut them off near the trunk. Examine the tree for fungal infections. Fungal infections such as tree cankers caused by the fungus myxosporium create swellings on branches. To remove, dip your pruning tool in a mixture of 70 percent denatured alcohol and 30 percent water in between cuts to avoid spreading the disease. Remove any low-growing branches from the tree. There should be no branches within 2 m (about 6 1/2 feet) up the height of the tree. Softwoods used in furniture construction are becoming increasingly scarce. Despite the fact that tulip trees are hardwoods, they can serve as a substitute for softwood in the furniture making process. It’s most commonly used for unexposed furniture parts such as plywood backings, veneer, pulpwood filling and framing. Tulip tree wood also has use in the building of furniture such as tables and chairs. The furniture sometimes preserves the wood’s light color or is stained to resemble cherry. Tulip tree wood is sometimes used as a substitute for basswood in Venetian blinds. Tulip tree wood has many uses in home construction. Kitchen and bathroom cabinets are available made from the wood. It can also be used in the framing of the home as well as in moldings, built-in shelves, interior trim, doors and flooring. According to Purdue University, pioneers in the United States used tulip tree wood for the upper logs of their cabins. The wood was also turned into boards for use in general construction and millwork. Heavy timbers were used to create covered bridges. Low-grade tulip tree wood is used to construct crates, pallets, shipping boxes and fruit containers in addition to toys and novelty products. Water the tree thoroughly to saturate roots after planting and keep the soil evenly moist for two months. Water for long periods afterward, once a week unless it’s very dry or hot, at which time give the tree extra water. Top dress with 1 inch of a 50/50 mixture of organic compost and well-rotted manure in the spring and late summer. Water well to leech it into the soil. Apply an acidic fertilizer once a year in early spring. Follow manufacturer’s directions on amount to apply. Apply a balanced fertilizer if the soil already is acidic. Mulch the tree with shredded bark 3 inches thick. Replenish the mulch each spring. Cut off dead and disease branches. This tree has a pleasant tulip-like fragrance from its greenish-yellow flowers that will show in mid spring. This shade tree will have gold and yellow tones as its fall color appeal. Tulip poplars require full sun and a partially wet, well drained, acidic soil. Soil types should be clay, sand or loam. It is resistant to breakage and needs little pruning. The tulip tree is hardy in USDA hardiness zones 5 to 9a. Tulip poplar can potentially get cankers, leaf spots, powdery mildew, sooty mold, and verticillium wilt. Yellowing of the leaves is caused by the hot dryness of the weather, and is not indicative of disease. The largest found tulip trees are in North Carolina’s Joyce Kilmer Forest. Some of them reach 150 feet in height and 7 feet in trunk diameter. Pour the potting mix into the seed starting tray to within 1 inch of the top. Water the soil well, mixing it to ensure uniform moisture, and allow the water to drain from the bottom. Scatter the seeds on the surface of the planting mix, but do not cover them with soil. Cover the starting tray with plastic wrap and place it in a sunny area that has temperatures between 75 and 85 degrees. Your seeds can start sprouting within two days. Remove the plastic wrap when the seeds have sprouted. 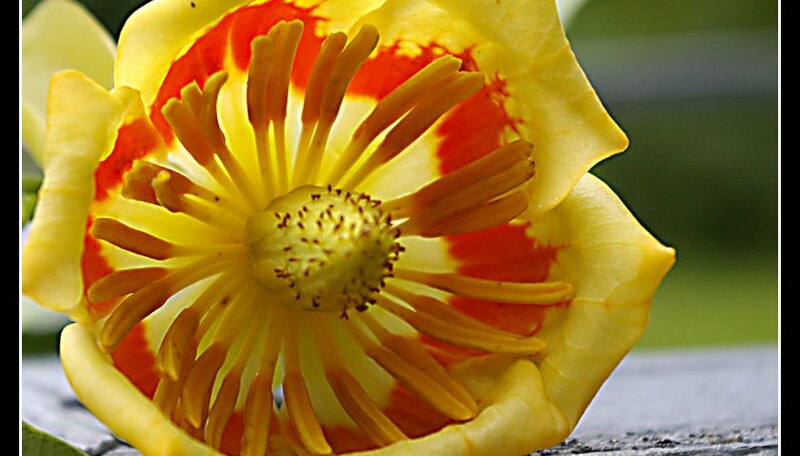 Plant the African tulip tree in an area that gets all-day sun when the weather is warm and it has at least three sets of leaves. 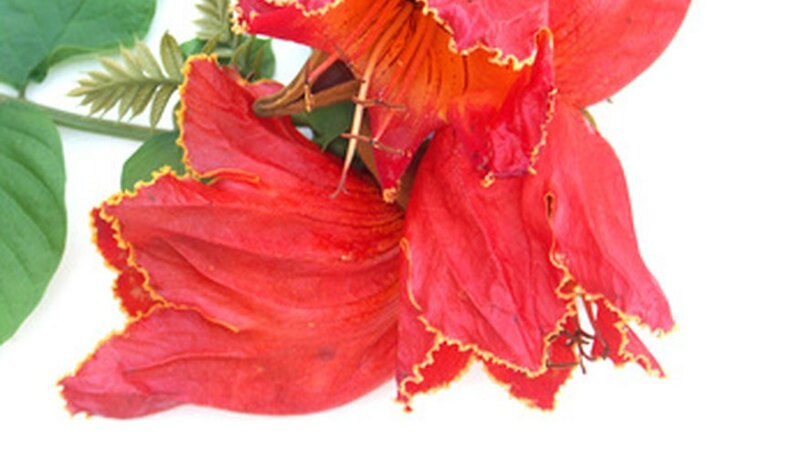 There are no special soil requirements for the African tulip tree other than that the soil be well-draining. During the tulip tree's first three years of life, seedlings average 1 foot of growth per year. Seedlings started on areas that have suffered a fire grew more rapidly and averaged 3 1/2 feet in three years, according to the U.S. Forest Service's website. Once a seedlings tops 3 or 4 inches in height, it generally will reach maturity. Seed production begins when the tree reaches 15 to 20 years of age. 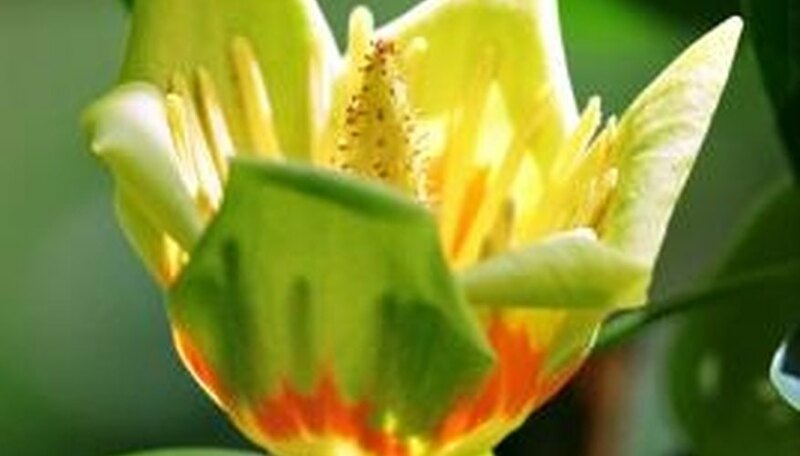 The tulip tree will continue to produce seeds for approximately 200 years. Unfortunately, the tulip tree's seeds have low viability of only 5 to 20 percent. Fertile seeds can remain viable for up to eight years before germination begins. Tulip tree seeds require a period of cold stratification before germination growth will begin. If the seeds are kept at 36 degrees Fahrenheit for 140 days, the rate of germination can be increased to 90 percent, according to the U.S. Forest Service's website. The seeds must be kept consistently moist to grow. The tulip tree grows from the southern portions of the New England states westward through Ontario and into Michigan. Its range extends as far south as Louisiana and northern Florida. It grows in abundance in the Ohio Valley. The typical tulip tree reaches 80 to 150 feet, making it among the tallest of the eastern hardwood species. The trunk can be as wide as 6 feet, and a tree can live for more than 300 years. The tree's flowers resemble the shape of tulips with six yellow-green petals and a splash of orange at the base. The flowers are 2 inches in diameter and appear after the four-lobed leaves, which also look like the outline of a tulip, develop on the branches. Four types of insects can damage the tulip tree: tuliptree scale, the yellow-poplar weevil, the rootcollar borer and the Columbina timber beetle. Yellow poplar wood is a component in veneer and furniture parts, while wildlife such as bobwhite quail and squirrels eat the tree’s seeds. A tulip tree has the ability to produce large amounts of nectar, and landowners value it as a source of shade and beauty. If a tulip poplar is losing leaves in the summer--particularly if it's a transplant--the problem is likely due to hot, dry weather. Leaves yellow and drop. Sometimes brown spots develop first.